Bushnell 730134 Trophy 1x28 Red Dot Reticle Riflescope 730134 FREE SHIPPING! The Bushnell Trophy 1x28 Multi-Reticle scope allows you to choose between four dial-in reticles to suit different tasks. It comes with 3 and 10 MOA red dots, a 65 MOA circle with a 3 MOA red dot, and a crosshair. The scope's unlimited eye relief allows a variety of comfortable shooting positions, and its Amber-Bright optical coatings enhance contrast for easier target identification and engagement. 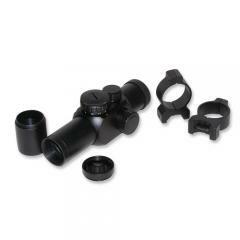 Its advanced optics provide a clear, bright image even in low-light conditions. The rugged, compact tube is shockproof for recoil resistance, and includes a nitrogen fill that prevents fogging and water intrusion for safe all-weather use. ©2002-2019 CopsPlus.com: Bushnell 730134 Trophy 1x28 Red Dot Reticle Riflescope 730134 FREE SHIPPING!